I have many memories surrounding the game of football. When I was seven I was a mascot for the high school pom squad thanks to my older cousin. I loved everything about being a part of the team and most of all I loved cheering at the games! My favorites were football games and I am still a big fan of football these days. Besides the fun and excitement of the game itself, I really loved the concession stand snacks at half time! I was a foodie even back then and I can still remember the taste of those concession stand nachos! Yum! Considering that around 75,000 chicken fingers are sold the the Super Bowl, I would say that I am not the only one that loves concession stand food! 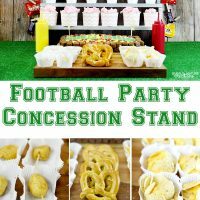 That’s why when I was planning a fun Superbowl party this year I really wanted to bring in my memories of the concession stands for the big game! I made a fun Skittles Football Stadium Cake for this party because Skittles is here to Make Super Bowl 50 Even Sweeter as an official sponsor of the NFL/Super Bowl. Skittles, Starburst, and Snickers products are available to purchase on Amazon and for a limited time, participating products will be on sale for up to 20%. I was glad to have found them there because Amazon makes it so easy to purchase things and I love how quickly I receive the items I order from Amazon. The candy was great for the cake and as part of the concession stand treats! This Skittles Football Stadium Cake was a favorite treat at the party! The cake itself is a regular cake mix that I flavored with some orange flavoring for a fruity taste. It really tasted great with the Original Skittles on top. For the decorations, the Skittles became the football players and also the crowd sitting in the stands. The Snickers around the outside of the cake mimic a football stadium’s walls. In the middle of the cake I placed a brown M&M for a football. The rest was just green and white icing and the two goals were made of toothpicks and yellow paper. So easy! Prepare a 9x13 inch cake pan. Mix and bake all the ingredients according to your cake mix with the the food coloring and orange extract (add these to the batter before baking). Let the cake cool and cover with the green icing. Make 11 even stripes across the cake for the football field. Next start stacking 2 layers of Snickers to the outside of the cake. Then add skittles to either side of the cake. I used 4 different colors of the Skittles for this. Next make your football players with 2 different colors to represent the 2 teams (11 players to each side). Place them in a football formation. Then add the brown M&M in the middle to represent the football. 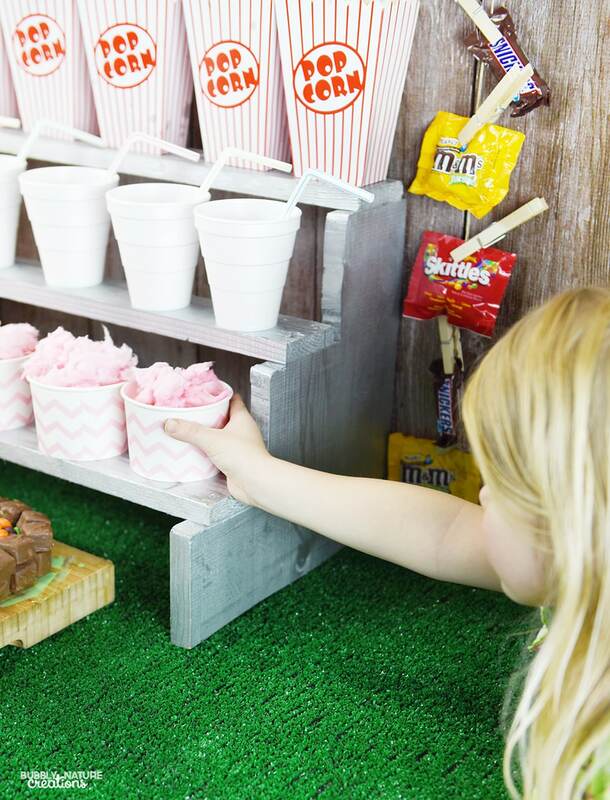 I included classic concession stand favorites like corn dogs, popcorn, soft drinks, nachos, cotton candy, pretzels, Skittles, M&M’s, and Snickers. Most of the items I made in mini portions so that everyone could have room to try all the different concession treats. 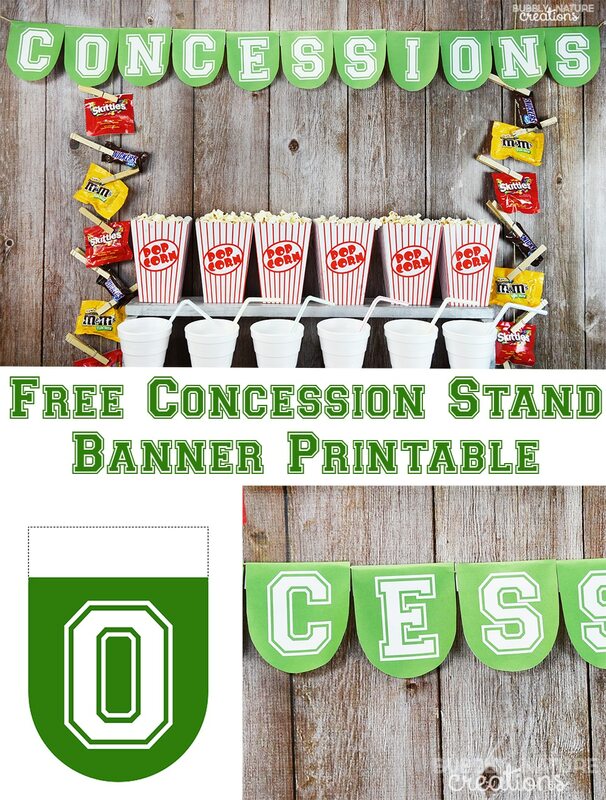 For the backdrop I made this fun concessions banner. You can print off your own banner for free here. Below the banner I made a hanging display of Snickers, M&M’s, and Skittles with the candy I bought from Amazon. I think this was my favorite detail because it reminds me of the concession stands from the games I went to growing up. 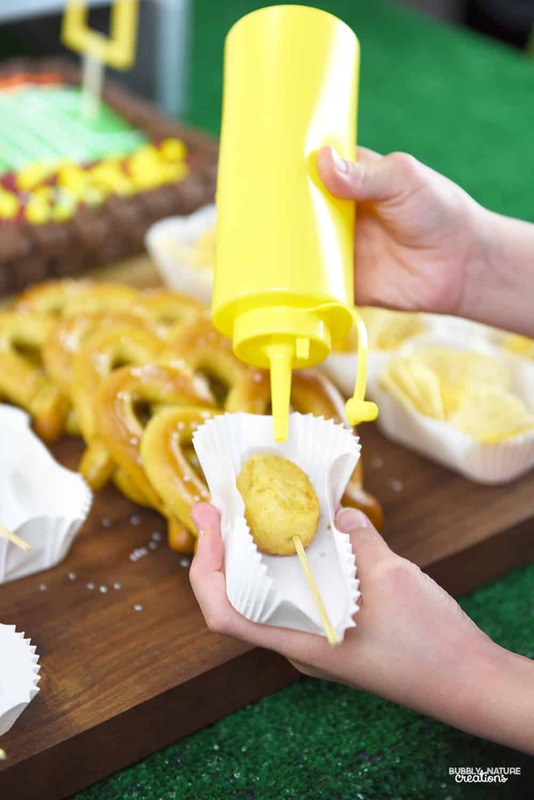 What items would you include for your own Football Party Concession Stand? I’d love to hear what your favorite concession stand treats are! The printable is not there.